Ulster ‘A’ stand on the brink of making the knock out stages of the British and Irish Cup for the first time since 2012. Kieran Campbell’s side lead Pool One ahead of Friday night’s clash at Kingspan Stadium with London Scottish and the former Ulster scrum half feels the competition is very significant to Ulster as a whole. “To us it is very important and at the moment we are priding ourselves that we are developing a system to bring through very good players,” said Campbell. “I think that is being seen at the top end even in recent weeks with the likes of Rob Lyttle and Ross Kane playing, Jacob Stockdale there is starting to be more of a production line and a more consistent production line as well. 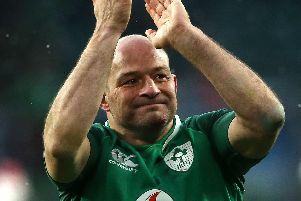 “What has been important for those guys too and you can see how serious the Britsh & Irish is being treated this year is mixing guys like Tommy Bowe, Dan Tuohy and Ricky Lutton in with the younger players to give them experience from an older guy who sets a level of standard that is higher, has a better knowledge of the game to help them accelerate. “Hopefully that is coming through in terms of these guys not only being able to perform at this level but when you see Ross Kane, Rob and Jacob getting their chance at senior level we can see it is starting to have an effect. It is tight at the top of Pool One with Ulster ‘A’, Jersey and London Scottish all in with a chance of progressing to the quarter finals . With London Welsh withdrawing Campbell knows the only way to secure a place in the last eight is to top the pool. “It’s the only guarantee and it know it’s clichés but it is one game at a time make sure we win this one then work very hard away from home at Jersey to get a win there but we are concentrating solely on this one at the moment. “As it has gone pro rata every point is important now so London Welsh withdrawing has made it a little bit more interesting, we are confident the players have already started preparing well. “Les has given us the opportunity to start preparing last week and we had some idea of the team we’d have last week, that little bit of extra preparation, with the players having a better understanding this year and with the younger players stepping up to the mark it’s a nice mix for having a successful performance on Friday and to keep us top of the group. "It is hugely important for us, Les has said from the outset that is really important that we start to build not only a depth to our playing basis but a depth to our playing basis that will develop to the requisite level to play for Ulster. “One of Les key drivers is that this ‘A’ team starts to perform really well, that has meant they has been a huge synergy in terms of developing this group of players both technically and tactically to perform but to also perform at a level that they can deliver with the senior players together." PRO12: Scotland flanker Hamish Watson has signed a new two-year deal to stay at Edinburgh until May 2019. “I’m absolutely delighted to be staying at Edinburgh, it’s a great club with a great squad, coaching team and backroom staff, and I love the city,” said the back-rower.